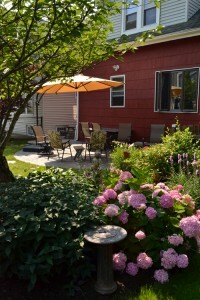 Whoever happens to be out does the weeding in the garden shared by Kevin and Phyllis Baer of 132 Whitfield Ave. and their next-door neighbors, Paul and Maureen Rybczynski of 128 Whitfield Ave. in South Buffalo. 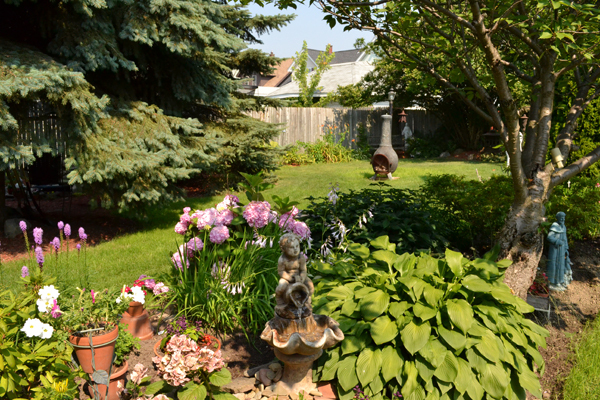 The garden was on view during the 11th annual South Buffalo Alive Garden Walk on Sunday, July 17. The view above is looking into the Rybczynski yard, and below right is looking into the Baer yard. The garden continues down the length of the backyards. The garden started out as two separate gardens. The Baers had a fence around their backyard when their children were little, but when the fence fell down years later, they didn’t replace it. The Baers had planted a flower garden along their side of the fence, and the Rybczynskis had planted one along their side. With the fence down, the two gardens just blended together, Kevin said. The Baers have lived in their home 32 years, and the Rybczinskis have lived next door even longer. The blue spruce that you can see on the left in the first photo is one of two towering trees that were only knee high when the Rybczynskis planted them, Kevin said. 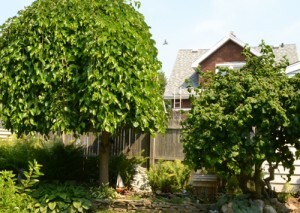 At the back of his yard, Kevin planted the tree called Harry Lauder’s Walking Stick, at right in the photo above left. “I started it from a twig 20 years ago,” he said. Its branches are gnarled and twisted and are used for the well known Irish canes called shillelaghs. To the left of the Harry Lauder is a weeping mulberry. Nestled between the trees is a pond. The Rybczynskis also have a pond, which is shaded by the magnificent spruces. 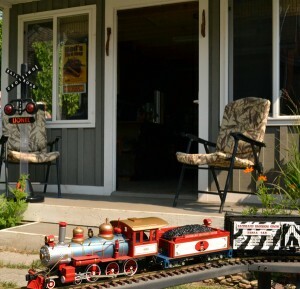 A highlight of the Baers’ yard is a garden railway. “I always had trains growing up,” Kevin said, and his own children had trains in the basement. It was his dream that when he retired, he’d have a railroad in his yard. He finished setting up the loop you see in the photo above left just two days before the garden walk. He wants to extend the tracks so the trains run throughout the yard. Before Kevin could begin work on the railway, his wife insisted that he build the two-story workshop that you see behind the train. She had three requirements for the building: it had to have a porch, a Dutch door and a corner for gardening work. 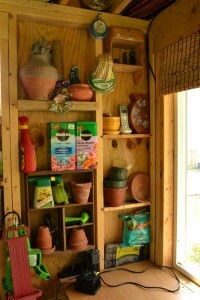 The splendid potting area can be seen at right. It was great seeing you, cuz. Your garden yard and train layout is really taking shape, I know certain people are looking down on you with pride. Phyllis and Kevin…How wonderful to read about someone I know….such a beautiful, relaxing spot. better in person. The trains bring back memeories of our childhood. Dad would love your backyard. Cuz, it was great seeing you all on Sunday. 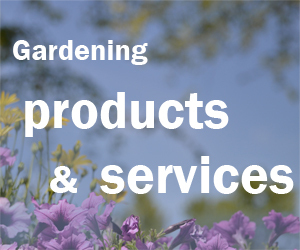 Your garden pictures are great. How about cocktails there some evening? Wow that sure is a garden to be proud of. A lot of work but a lot of joy.